Continuity mistake: After Molly Ringwald does her trick, she puts the lipstick away twice. It has a shot of her putting it away from the front and then another one from the back. Continuity mistake: Claire's hair changes in the library scene. First, it's flat, then she's got it poofed up with a flip on the ends. Continuity mistake: When Vernon is in the basement files and Carl walks in, the card in the drawer is tilted and it stays this way for a few shots. In the next shot, the card is straight, but in the shot after that, it is tilted again. Trivia: John Hughes, the director, originally wanted John Cusak to play Judd Nelson's bad boy role. He finally gave in when he realized that John didn't look "tough enough". 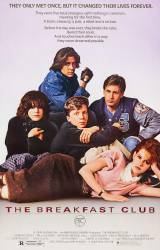 Trivia: Director John Hughes wrote the script in two days, on July 4-5, 1982. Trivia: In the begining of the film they are showing shots of stuff around the school (with talking over top). One of the things it shows is a plaque with graduation photos. The student on this plaque with the phrase "Man of the Year" is the janitor, only a bit younger. Question: I realise that a lot of US schools look similar but would this be the same school used in Ferris Bueller's Day Off (by the same director)? Chosen answer: According to the IMDB, the answer is yes. Both movies used the same two high school locations: Glenbrook North High School, Northbrook, Illinois; and Maine North High School, Des Plaines, Illinois. The director, John Hughes, directed both movies and decided to use the same school. He also uses the name Shermer for the name of the high school in Breakfast Club and for the name of the suburb in which the Bueller's live. Question: Why is it that in the scene where Bender is in the gym, he has a sneaker and boot on, but when he gets back to the library, he has replaced it with his boot? Was there a deleted scene where he loses his shoe or something? It just does not make sense that he would somehow find 1 sneaker, decide to wear it, then kick it off on his way back. Chosen answer: Bender found the shoe in the gym, and decided to wear it. When the principal kicked the basketball, Bender jumped out of the shoe. He left with his boot, and was wearing it when he arrived at the library. Question: You can't have a gun in school, but you can put a guillotine in your locker? Chosen answer: It was a flare gun. I very much doubt that this is something that the faculty are aware of. Brian was obviously caught with the flare gun because it went off in his locker, whereas Bender has not been caught with the guillotine in his locker.